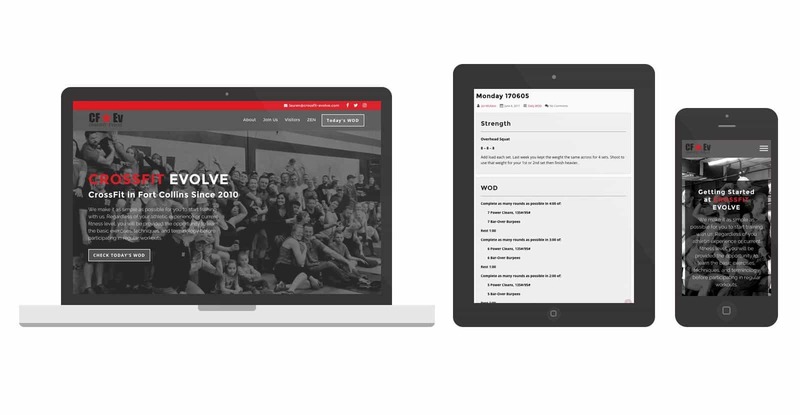 Crossfit Evolve is a strength and conditioning program that focuses on constantly varied functional movements performed at high intensity in Fort Collins, CO.
With WordPress, updating your new site is a snap. The web build was unique in that we needed a way to display information for each new daily workout (quickly and easily). We also needed to show the entirety of each post on the homepage and paginate for viewing past workouts and messages. The website also needed to work on multiple devices. In addition to creating a unique blog homepage we also were tasked to create a simple way for new customers to get information. For current athletes the website is built to foster an easy to read knowledge base on upcoming events (which is an integrated calendar feature displaying ‘with details’ the upcoming events). The site also has a unique gallery feature allowing the site’s admin the ability to add a gallery, style it and embed it on any page via a shortcode. Using the standard Spark Logix Studios Framework we were able to create and style the website in a way that now the site’s admin can easily modify pages and create new pages using a long list of pre-created shortcodes.